Sen. Kirsten Gillibrand (D., N.Y.) was the only Democratic member of the committee tasked with questioning President Donald Trump's pick to head the Environmental Protection Agency who skipped the Wednesday confirmation hearing. She chose instead to stay in New York following the Tuesday night launch of her presidential run. Gillibrand has sat on the Environment and Public Works Committee since she first joined the Senate in 2009. She has said "protecting our environment is one of the most important responsibilities we all share." When it came to questioning acting EPA administrator Andrew Wheeler on Wednesday, however, Gillibrand decided it was more important to work the media on the campaign trail. 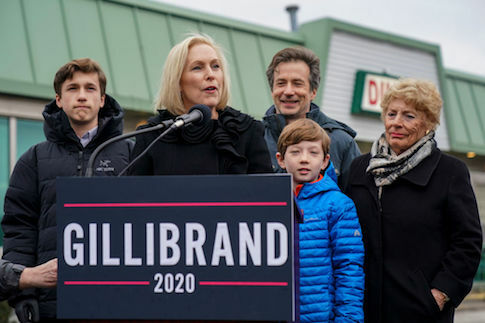 After announcing her run for president Tuesday night on The Late Show with Stephen Colbert, Gillibrand campaigned at a diner near her home in upstate New York. Meanwhile, all nine of her Democratic colleagues on the committee were in Washington, D.C., for Wheeler's confirmation hearing, pushing him on issues such as whether he believes in climate change. Among the senators questioning Wheeler were at least three others, Sens. Bernie Sanders (Vt.), Jeff Merkley (Ore.), and Cory Booker (N.J.), who like Gillibrand have presidential aspirations. Gillibrand's Senate office did not respond to inquiries into why she chose to launch her campaign in New York on a day the committee had such an important hearing. Gillibrand and the rest of the committee members are required by committee rules to receive notice of a hearing at least one week before it happens. It is unclear whether Gillibrand's campaign launch was mapped out before she learned the date of Wheeler's confirmation hearing. It was first reported that Gillibrand would be making the announcement on Colbert on Monday, several days after Wheeler's hearing was scheduled. Climate change is expected to be a major issue in the Democratic primary, with polls showing it has emerged as a top priority for the party's voters. A growing number of expected candidates have gotten behind the radical new "Green New Deal" proposal, which calls for massive government spending to rapidly push the nation toward renewable energy. UPDATE 3:50 p.m.: This story has been updated to clarify that Gillibrand was the only Democratic senator absent from the hearing. Sen. Richard Shelby (R., Ala.) also was not present. This entry was posted in Politics and tagged 2020 Election, Kirsten Gillibrand. Bookmark the permalink.